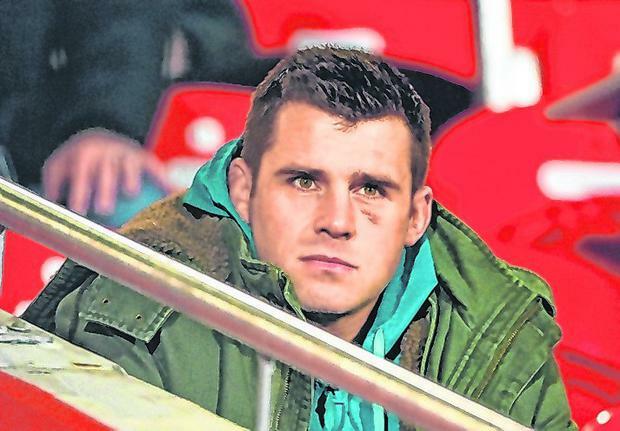 You only have to watch CJ Stander play rugby to realise his pain threshold is not that of a normal human. Ask him about playing for almost an hour with a fractured cheekbone and a broken eye socket and the suspicion is confirmed. 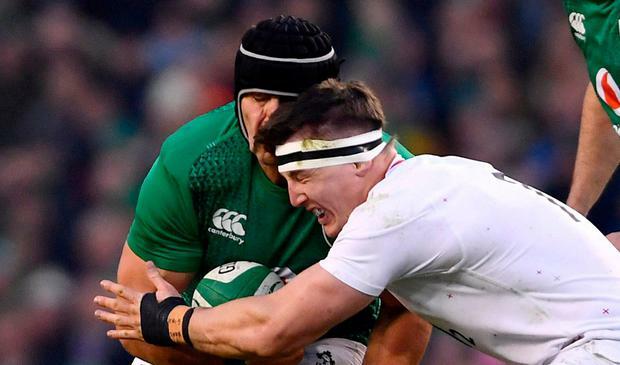 Seven minutes and 20 seconds had elapsed in Ireland's Six Nations opener against England when Peter O'Mahony whipped a left-handed pass to his Munster team-mate who made a carry like the thousands of others he has made. After a little readjustment, he took the pass on the front foot and accelerated toward Tom Curry. Both men went in high, the England flanker won the collision, the ball was recycled and the game went on. Stander got up gingerly, but made his way back into the attacking line. By the time he came off after 65 minutes he'd made 11 carries and 19 tackles. It was only when the cameras focused in on his face as he left the pitch that it became clear something wasn't right. A few hours after the disappointing defeat, Stander's brother-in-law Ryk Neethling revealed the effects of his crunching collision. "I fractured my eye socket and the cheekbone," he said yesterday. "It wasn't too bad. It wasn't really that sore. I thought it was a nose break when it happened. My nose has broken probably six times since December so I thought it was just normal and kept on playing. "I blew my nose just after half-time and I could feel this little bump. I just spoke to the doc and he said 'it doesn't look good' and I was taken off after about 65 minutes. "I think it was my first carry, four or five minutes into the game. It didn't really feel like anything. "A few times before this game, I would carry and I would get a good tackle in or someone would tackle me and my insides would be in my cheek so out of 10 this probably felt like a one or a two. It just felt like a normal face hit. "I remember when I was six years old my dad actually ran over me with the truck, the pick-up, that was a Sunday evening and I went to school on a Monday morning. That was worse than this. "I just kept on going. I didn't really feel anything. When you wear a scrum cap, you've got a bit of tunnel vision and I couldn't really feel anything and when the doc told me to get off, I took it off and it felt like my cheek was sitting in the wrong spot. "It wasn't really sore. It just went numb. "I've severed a nerve earlier, about four years ago, going down from my eyebrow to my teeth so there would be numbness anyway so that just flared up again, so I couldn't really feel anything anyway. "The worst part of it was I couldn't eat for two weeks. I was just having soft food and using protein shakes and things like that." Stander talks fast, so it might have been easy to miss the little detail about his farmyard accident two decades ago in George. "My dad was going to feed the calves," he recalled. "Me and my cousin were on the farm and he was like, 'your dad is going to leave us' and I was six and he was about 15. "We ran after my dad. There was this narrow field so you could just reverse back and he couldn't see us. "We jumped on, he was fine, I missed the step and fell underneath and I hit my head on the ball-joint, where the trailer hitches on, and then I just remember my dad grabbing me from underneath and saying 'what are you doing?'. I was like 'sorry about that'. "I had a scar and I went to school on the Monday morning. That was a Sunday evening. That's what happens on a farm. Me and my brother we were loose on the farm so we got used to those hits early. "After that, look, I like those collisions, I like running into someone and getting a good hit. "It's a personal battle every time you run on to a pitch and when you get a good hit sometimes you go, 'that's a good f*****g hit man' and I can't wait for the next one to get someone back. "There's a feeling I get from carrying and tackling, I think all of us do, it's a physical game and things can happen. We all love that feeling, it's a good feeling, a bit of tingling in your stomach when you get a hit." That stomach was aching for some real food, while the part of his brain that gets off on hits had to take a break as well. "They asked me do I want to take a break, a week off or so, and I said no," he said. "So straight away, on Tuesday I started running again. I couldn't really eat for like 10 days I'd say, so I was drinking and having soft foods - pasta, cut up very small, no meat, I couldn't chew anything because I couldn't put pressure on it. "I started (back in the) gym on the Wednesday, so there wasn't really a big difference. "The good thing was that I spent some time with the injured boys down in Munster and it was a great set-up. "We trained hard in the morning, had a nice long breakfast and trained hard again in the afternoon, it was nice to reconnect. "It was good to get that break. Sometimes when I was younger, not that I'm saying I'm old, but you just want to play and be involved in everything . . . I did a lot of speed work again, a lot of footwork, and just started enjoining training again. "The four weeks was very good. It was good mentally, and on the afternoons off I did a few things around the house as well. "It's tough playing touch and playing the ball and not training with the boys but I took some contact last week and everything's fine, no problems. "We trained against the U-20s and in fairness to them they never hold back at all, it doesn't matter if you're wearing the wrong bib or the right bib, they gave it to us fully. It's great to be back." During his time out, he and his wife Jean-Marie announced that they are expecting a child in August. "My wife's in good form so, yeah, looking forward to it," he said with a smile. "I'm ready for it. A lot of people have given me a lot of advice but look, me and Jean-Marie, that's all we have in Ireland, it's just me and her so to someone else with us will be great. We're very, very excited. "The dogs are going to be in trouble. They're going maybe to move down the ranks, so we'll see what happens."